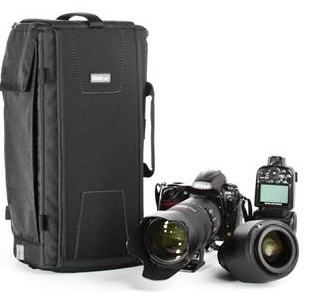 If you want a bulletproof camera bag, either of these exceptional products from Think Tank Photo will serve you well. There are major functional differences between the two, but the build quality for both is remarkable for the strength of the materials used and the thought that went into the designs. The Sling-o-Matic 10 Sling Camera Bag holds less than the rolling bag and is designed for more casual around town use; the Airport Takeoff Rolling Camera Bag is a hold everything pack that you can roll, or carry with the thickly padded shoulder straps. It’s perfect for longer trips and will roll through an airplane’s narrow aisles and fit into an overhead compartment. The unique feature of the Sling-O-Matic is a track system that enables the user to slide the pack from one shoulder to the other with one hassle-free maneuver. No learning curve is involved. And no matter which shoulder you use, when the pack is swung around in front of you, the top compartment with your gear is there at your finger tips. The Sling-O-Matic comes in three different sizes. I selected the smallest because of weight considerations. The pack easily accommodates a pro-size Digital Single Lens Reflex Camera (DSLR) with three to four lenses. 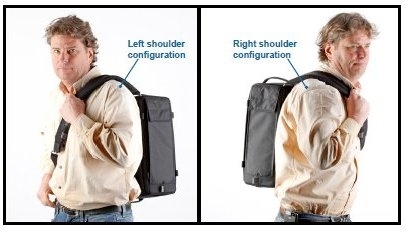 The larger Sling-O-Matic 20 and 30 can carry a DSLR and up to six lenses. The 30 can also hold a 15-inch laptop computer. The Model 10 comes with a slot on the side for a tripod and includes a rainfly. There are plenty of zippered pockets for odds and ends. You’ll also find good strong grips at either end of the pack that make it easier to bag the pack from shoulder to shoulder. 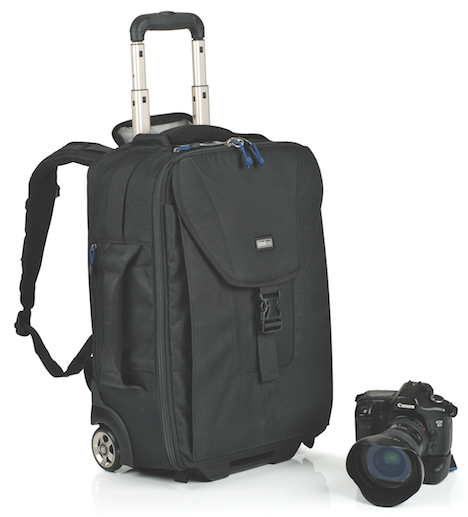 Of the several camera bags we’ve looked at recently, The Airport Takeoff Rolling Camera Bag is easily the most impressive. From the moment you unpack it, you can feel its durability. This is not a bag that will crush and become deformed. It comes with so many inserts and storage possibilities that Think Tank wisely includes a large front and back poster suggesting ways you can arrange your gear in the copious storage compartment. This poster is a nice indication of value added in an already exceptional product. There’s no escaping the fact that if you loaded the Airport Takeoff Rolling Camera Bag to its maximum capacity, you’re going to be hauling a lot of weight, but the high quality wheels and telescoping handle turn that weight into a piece of cake. And if you’re rolling down pavement and come to an area too narrow or rough for wheels, simply unzip the rear compartment and pull out the thickly padded shoulder straps. You’ll also find an expandable front pocket that will accommodate a 15-inch laptop or some 17-inchers, depending on configuration. A few months lifting this outfit and you can fire your personal trainer. Setting aside all the extras — the gear bag, rainfly, tripod holder — what can you actually carry in this professional pack? Think Tank says it’ll hold two pro or standard size DSLRs with or without the lenses attached, a laptop computer, an external flash unit, SD cards, plus cables and batteries, among other accessories. There are two strong grips at the top and bottom to make it easy to hoist the pack into an overhead compartment without tearing a rotator cuff or ruining the crease in your seat mate’s trousers. There are also extra straps included so that you can place your Airport Takeoff Rolling Camera Bag on top of your suitcase and fasten it to the telescoping handle and roll both together. Both products are highly recommended.